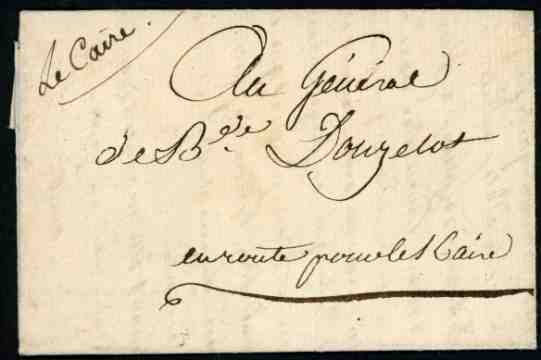 FRENCH OCCUPATION OF EGYPT - UNIQUE MANUSCRIPT "LE CAIRE" ON FOLDED LETTER WITH MENTION OF THE BATTLE OF ABOUKIR BAY; 28 Mar. 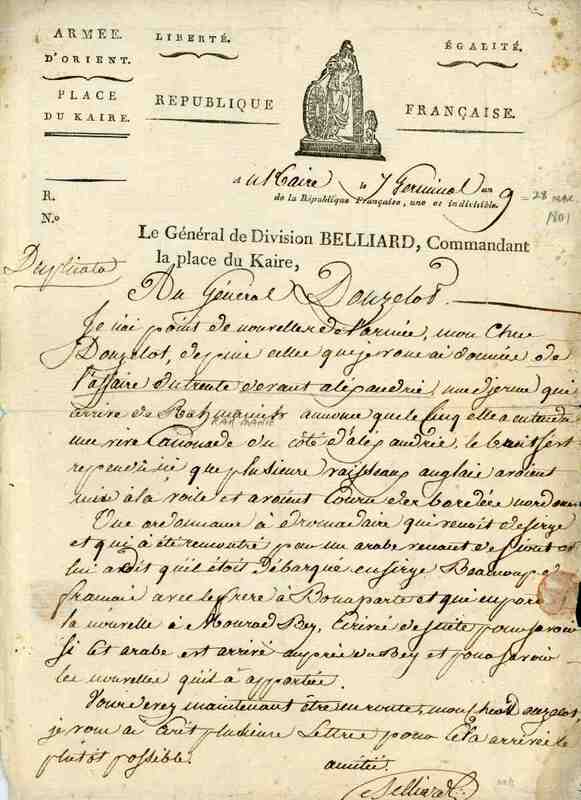 1801 entire letter written on the printed headed paper of "ARMEE D´ORIENT PLACE DU KAIRE" from "le Caire" (7 germinal an 9) signed by General Belliard (the French Commander in Chef in Cairo at the time) and addressed to "General de B[riga]de Douzelot en route pour le Caire" boldly endorsed in a second hand "Le Caire" (manuscript postmark in the absence of the "LE CAIRE" Handstamp). The letter reveals the chaos ensuing after the British victory at Aboukir 8 days previously; the writer had heard nothing from the French Army since "l´affaire du trente [of the previous French calendar´s month = 20 Mar. 1801] devant Alexandrie"! 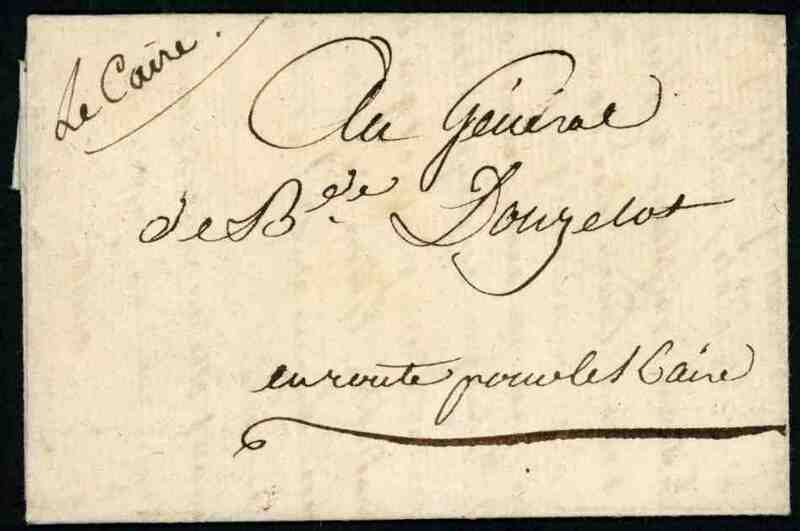 UNIQUE manuscript postal marking from the final days of the French Occupation of Egypt. A great military postal history Exhibition Item. Kurt Wolfsbauer mentions in his article "the french campaign in Egypt, 1798-1801" (Collectors Club Philatelist, march 2002) only 9 covers with a manuscript postal marking (Belbeis, Benesoueff, Siouth, Salhieh), but doesn´t record a "le Caire". WIKIPEDIA: Augustin Daniel Belliard, comte Belliard et de l´Empire (March 23, 1769 in Fontenay-le-Comte, Vendée – January 28, 1832 in Brussels) was a French general. Belliard became an officer between 1792 and 1793 under Dumouriez in Belgium. He then fought under Hoche in Italy between 1796 and 1797, near Castiglione, Caldiero, Arcole, and became a general. A participant of the 1798 Egyptian expedition, he fought in the Battle of the Pyramids, became governor of Upper Egypt, and advanced with his troops into Nubia. He also fought back the enemy cavalry at the battle of Heliopolis. He played a major role in the taking of Bulal and Cairo. In 1805, he fought against Austria, Prussia and Russia, under Joachim Murat, and eventually was awarded the position of governor of Madrid. During the Russian campaign in 1812, he fought at Dresden, Leipzig and Hanau, again under Murat. He was severely wounded in the battle of Craonne. After Napoleon was overthrown, Louis XVIII awarded him the title Peer of France (Pair de France). When Napoleon returned from Elba in 1815, Belliard became commander of the Mosel forces. After the Battle of Waterloo, he surrendered to Louis XVIII, had his title Pair taken away, was imprisoned for month, but then released and reinstated as Pair in 1819.